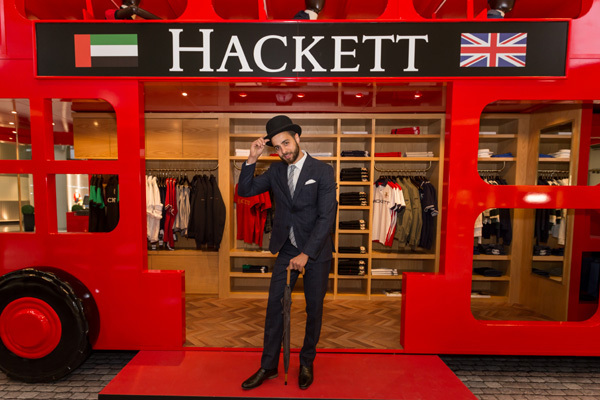 Luxury British menswear brand Hackett London has launched an exclusive pop up concept in The Dubai Mall. Located in the Fashion Catwalk of The Dubai Mall from March 9 – 17, the pop-up, which will take the form of a traditional London Bus, will offer the latest collection of luxury menswear and Accessories, as well as limited edition polo and UAE exclusive pieces. The bus is a double-decker bus, with an Aston Martin-themed bus stop and another Hackett stop. It will have a changing room and selfie driver booth. Available exclusively at the op up will be the UAE limited edition polo, designed to have the colours of the UAE flag and produced in limited quantities, which are numbered from 1 to 400. Hackett London established itself as the brand of choice for those with decidedly refined taste. Crafted for the modern gentleman with an enviable range of typically English classics and preppy sports-inspired goods, Hackett delivers dapper and sophisticated fashion that stands the test of time.